Lunchbox philosophy, or the world according to the Japanese lunchbox: how an object of sublime beauty offers a key to understanding Japanese aesthetics, design, and culture. The Makunouchi Bento, or traditional Japanese lunchbox, is a highly lacquered wooden box divided into quadrants, each of which contains different delicacies. It is also one of the most familiar images of Japan's domestic environment. When presented to the diner, the Japanese lunchbox seems straightforward enough; each of four food portions resides in its own compartment, apparently obeying a strict lunchbox geometry. So far, just food. But Kenji Ekuan reveals that a much deeper reading is possible, one that sees the lunchbox as nothing less than a key to an understanding of Japanese civilization, the spirit of form, and the aesthetic ideal in which the many are reduced to one. 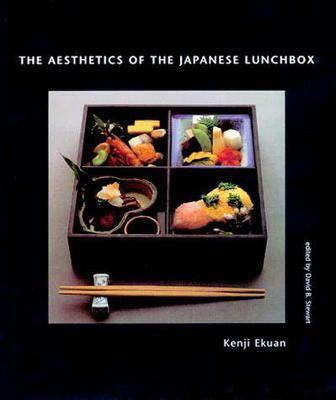 Ekuan reads the Japanese lunchbox as both object and metaphor. It is one of this book's many charms that he is able to see it as both simultaneously. He compares the visual pleasures of the Zen lunchbox to an aerial view of the Japanese archipelago; he invites us to savor its quadripartite structure as we savor the four seasons. In so doing, he unlocks the secrets of ancient Japanese rituals, celebrates the aesthetics of Japanese design, explores the contours of Japanese landscapes and technology, and delineates the forty-eight rules of the etiquette of Japanese form. With an agility more characteristic of poetry than of design criticism, he connects everything from food, television, motorcycles, package tours, and department stores to landscape, ecology, computers, and radios, all the while keeping his eye on his subject. In this book of magical transformations, nothing is what it first appears, but everything is deepened by "lunchbox theory." Consider the influence of the lunchbox on TV viewing, for example: chopsticks are used to stroll through a meal, just as remote control devices are used to browse TV channels. This book reveals a world of secret connections between its covers, in the spirit of the lunchbox itself. Ekuan argues his intriguing points with diaphanous prose.